Each employer is required by OSHA to keep records of fatalities, injuries, and illnesses. Specifically, they must record each fatality, injury and illness that is work-related is a new case, and meets one or more of the general recording criteria noted in Section 1904.7 (or the application to specific cases of Secs. 1904.8-11). Additional criteria apply to needlestick and sharps injury cases, tuberculosis cases, hearing loss cases, medical removal cases, and musculoskeletal disorder cases. Safety Records: How do You Determine Work-Relatedness? So, remember that the illness or injury is deemed work-related if an event or exposure in the work environment either caused or contributed to the resulting condition or significantly aggravated a pre-existing illness or injury. Work-relatedness is presumed for injuries or illnesses resulting from events or exposures occurring in the work environment unless an exception specifically applies. Additionally, it’s important to note that the work event or exposure need only be one of the discernible causes; it need not be the sole or predominant cause. You must also consider a case to meet the general recording criteria if it involves a significant injury or illness diagnosed by a physician or other licensed health care professional, even if it does not result in death, days away from work, restricted work or job transfer, medical treatment beyond first aid, or loss of consciousness (e.g., cancer, chronic irreversible disease, a fractured or cracked bone, or a punctured eardrum). Since the publication of the revised rule in January 2001, OSHA has received numerous questions about how the provisions of the new rule will affect the recording and reporting of injuries and illnesses in various situations. The purpose of this document is to provide answers to some of the more commonly asked questions related to the revised rule. Most of the questions that OSHA has received about the new rule are answered in the text of the regulation itself. Because the rule addresses, in clear and simple language, the most common recording and reporting questions that arise, it is important that persons with recordkeeping responsibilities read the regulation and supporting materials carefully. To facilitate this, this document provides electronic links to each section of the regulation. For sections of the rule not discussed in this document, please refer to the regulatory text. The questions and answers in this document do not themselves impose enforceable recordkeeping or reporting obligations; such obligations are imposed only by the regulation. This version was last updated on [11/21/01]. The OSH Act of 1970 requires the Secretary of Labor to produce regulations that require employers to keep records of occupational deaths, injuries, and illnesses. The records are used for several purposes. Injury and illness statistics are used by OSHA. OSHA collects data through the OSHA Data Initiative (ODI) to help direct its programs and measure its own performance. Inspectors also use the data during inspections to help direct their efforts to the hazards that are hurting workers. The records are also used by employers and employees to implement safety and health programs at individual workplaces. Analysis of the data is a widely recognized method for discovering workplace safety and health problems and for tracking progress in solving those problems. The records provide the base data for the BLS Annual Survey of Occupational Injuries and Illnesses, the Nation’s primary source of occupational injury and illness data. Question 0-2. What is the effect of workers’ compensation reports on the OSHA records? The purpose section of the rule includes a note to make it clear that recording an injury or illness neither affects a person’s entitlement to workers’ compensation nor proves a violation of an OSHA rule. The rules for compensability under workers’ compensation differ from state to state and do not have any effect on whether or not a case needs to be recorded on the OSHA 300 Log. Many cases will be OSHA recordable and compensable under workers’ compensation. However, some cases will be compensable but not OSHA recordable, and some cases will be OSHA recordable but not compensable under workers’ compensation. Question 2-1. How can I get help to find my SIC Code and determine if I’m partially exempt from the recordkeeping rule? Question 5-3. What activities are considered “personal grooming” for purposes of the exception to the geographic presumption of work-relatedness in section 1904.5(b)(2)(vi)? Question 5-4. What are “assigned working hours” for purposes of the exception to the geographic presumption in section 1904.5(b)(2)(v)? “Assigned working hours,” for purposes of section 1904.5(b)(2)(v), means those hours the employee is actually expected to work, including overtime. Question 5-5. What are “personal tasks” for purposes of the exception to the geographic presumption in section 1904.5(b)(2)(v)? “Personal tasks” for purposes of section 1904.5(b)(2)(v) are tasks that are unrelated to the employee’s job. For example, if an employee uses a company break area to work on his child’s science project, he is engaged in a personal task. Question 5-6. If an employee stays at work after normal work hours to prepare for the next day’s tasks and is injured, is the case work-related? For example, if an employee stays after work to prepare air-sampling pumps and is injured, is the case work-related? A case is work-related any time an event or exposure in the work environment either causes or contributes to an injury or illness or significantly aggravates a pre-existing injury or illness unless one of the exceptions in section 1904.5(b)(2) applies. The work environment includes the establishment and other locations where one or more employees are working or are present as a condition of their employment. The case in question would be work-related if the employee was injured as a result of an event or exposure at work, regardless of whether the injury occurred after normal work hours. Question 5-8. If an employee’s pre-existing medical condition causes an incident which results in a subsequent injury, is the case work-related? For example, if an employee suffers an epileptic seizure, falls, and breaks his arm, is the case covered by the exception in section 1904.5(b)(2)(ii)? Neither employee’s injuries are recordable. While the employee parking lot is part of the work environment under section 1904.5, injuries occurring there are not work-related if they meet the exception in section 1904.5(b)(2)(vii). Section 1904.5(b)(2)(vii) excepts injuries caused by motor vehicle accidents occurring on the company parking lot while the employee is commuting to and from work. In the case in question, both employees’ injuries resulted from a motor vehicle accident in the company parking lot while the employees were commuting. Accordingly, the exception applies. Question 5-10. How does OSHA define a “company parking lot” for purposes of Recordkeeping? Company parking lots are part of the employer’s premises and therefore part of the establishment. These areas are under the control of the employer, i.e. those parking areas where the employer can limit access (such as parking lots limited to the employer’s employees and visitors). On the other hand, a parking area where the employer does not have control (such as a parking lot outside of a building shared by different employers, or a public parking area like those found at a mall or beneath a multi-employer office building) would not be considered part of the employers establishment (except for the owner of the building or mall), and therefore not a company parking lot for purposes of OSHA recordkeeping. Question 5-11. An employee experienced an injury or illness in the work environment before they had “clocked in” for the day. Is the case considered work related even if that employee was not officially “on the clock” for pay purposes? Yes. For purposes of OSHA recordkeeping injuries and illnesses occurring in the work environment are considered work-related. Punching in and out with a time clock (or signing in and out) does not affect the outcome for determining work-relatedness. If the employee experienced a work-related injury or illness, and it meets one or more of the general recording criteria under section 1904.7, it must be entered on the employer’s OSHA 300 log. Within eight (8) hours after the death of any employee from a work-related incident or the in-patient hospitalization of three or more employees as a result of a work-related incident, an employer must orally report the fatality/multiple hospitalization by telephone or in person to the OSHA Area office that is nearest to the site of the incident. An employer may also use the OSHA toll-free central telephone number, 1-800-321-OSHA (1-800-321-6742). Question 6-1. How is an employer to determine whether an employee has “recovered completely” from a previous injury or illness such that a later injury or illness of the same type affecting the same part of the body resulting from an event or exposure at work is a “new case” under section 1904.6(a)(2)? If an employee’s signs and symptoms disappear for a day and then resurface the next day, should the employer conclude that the later signs and symptoms represent a new case? An employee has “recovered completely” from a previous injury or illness, for purposes of section 1904.6(a)(2), when he or she is fully healed or cured. The employer must use his best judgment based on factors such as the passage of time since the symptoms last occurred and the physical appearance of the affected part of the body. If the signs and symptoms of a previous injury disappear for a day only to reappear the following day, that is strong evidence the injury has not properly healed. The employer may, but is not required to, consult a physician or other licensed health care provider (PLHCP). Where the employer does consult a PLHCP to determine whether an employee has recovered completely from a prior injury or illness, it must follow the PLHCP’s recommendation. In the event the employer receives recommendations from two or more PLHCPs, the employer may decide which recommendation is the most authoritative and record the case based on that recommendation. Question 7-1. The old rule required the recording of all occupational illnesses, regardless of severity. For example, a work-related skin rash was recorded even if it didn’t result in medical treatment. Does the rule still capture these minor illness cases? No, the size or degree of a work-related burn does not determine recordability. If a work-related first, second, or third-degree burn results in one or more of the outcomes in section 1904.7 (days away, work restrictions, medical treatment, etc. ), the case must be recorded. If an employee dies as a result of surgery or other complications following a work-related injury or illness, the case is recordable. 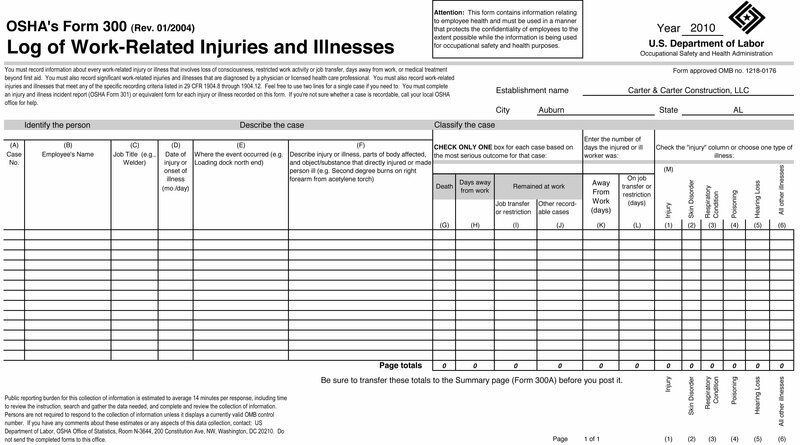 If the underlying injury or illness was recorded prior to the employee’s death, the employer must update the Log by lining out information on less severe outcomes, e.g., days away from work or restricted work, and checking the column indicating death. No, surgical glue is a wound closing device. All wound closing devices except for butterfly and steri strips are by definition “medical treatment,” because they are not included on the first aid list. Question 7-6. Item N on the first aid list is “drinking fluids for relief of heat stress.” Does this include administering intravenous (IV) fluids? Question 7-8. For medications such as Ibuprofen that are available in both prescription and non-prescription form, what is considered to be prescription strength? How is an employer to determine whether a non-prescription medication has been recommended at prescription strength for purposes of section 1904.7(b)(5)(i)(C)(ii)(A)? The prescription strength of such medications is determined by the measured quantity of the therapeutic agent to be taken at one time, i.e., a single dose. The single dosages that are considered prescription strength for four common over-the-counter drugs are: Ibuprofen (such as Advil™) – Greater than 467 mg Diphenhydramine (such as Benadryl™) – Greater than 50 mg Naproxen Sodium (such as Aleve™) – Greater than 220 mg Ketoprofen (such as Orudus KT™) – Greater than 25mg To determine the prescription-strength dosages for other drugs that are available in prescription and non-prescription formulations, the employer should contact OSHA, the United States Food and Drug Administration, their local pharmacist or their physician. Question 7-9. If an employee who sustains a work-related injury requiring days away from work is terminated for drug use based on the results of a post-accident drug test, how is the case recorded? May the employer stop the day count upon termination of the employee for drug use under section 1904.7(b)(3) (viii)? Under section 1904.7(b)(3)(viii), the employer may stop counting days away from work if an employee who is away from work because of an injury or illness leaves the company for some reason unrelated to the injury or illness, such as retirement or a plant closing. However, when the employer conducts a drug test based on the occurrence of an accident resulting in an injury at work and subsequently terminates the injured employee, the termination is related to the injury. Therefore, the employer must estimate the number of days that the employee would have been away from work due to the injury and enter that number on the 300 Log. Question 7-10. Once an employer has recorded a case involving days away from work, restricted work or medical treatment and the employee has returned to his regular work or has received the course of recommended medical treatment, is it permissible for the employer to delete the Log entry based on a physician’s recommendation, made during a year-end review of the Log, that the days away from work, work restriction or medical treatment were not necessary? The employer must make an initial decision about the need for days away from work, a work restriction, or medical treatment based on the information available, including any recommendation by a physician or other licensed health care professional. Where the employer receives contemporaneous recommendations from two or more physicians or other licensed health care professionals about the need for days away, a work restriction, or medical treatment, the employer may decide which recommendation is the most authoritative and record the case based on that recommendation. Once the days away from work or work restriction have occurred or medical treatment has been given, however, the employer may not delete the Log entry because of a physician’s recommendation, based on a year-end review of the Log, that the days away, restriction or treatment was unnecessary. Question 7-10a. If a physician or other licensed health care professional recommends medical treatment, days away from work or restricted work activity as a result of a work-related injury or illness can the employer decline to record the case based on a contemporaneous second provider’s opinion that the recommended medical treatment, days away from work or work restriction are unnecessary, if the employer believes the second opinion is more authoritative? Question 7-11. Section 1904.7(b)(5)(ii) of the rule defines first aid, in part, as “removing splinters or foreign material from areas other than the eye by irrigation, tweezers, cotton swabs or other simple means.” What are “other simple means” of removing splinters that are considered first aid? “Other simple means” of removing splinters, for purposes of the first-aid definition, means methods that are reasonably comparable to the listed methods. Using needles, pins or small tools to extract splinters would generally be included. Section 1904.7(b)(4)(xi) of the rule allows an employer to stop counting days of restricted work or transfer to another job if the restriction or transfer is made permanent. A permanent restriction or transfer is one that is expected to last for the remainder of the employee’s career. Where the restriction or transfer is determined to be permanent at the time it is ordered, the employer must count at least one day of the restriction or transfer on the Log. If the employee whose work is restricted or who is transferred to another job is expected to return to his or her former job duties at a later date, the restriction or transfer is considered temporary rather than permanent. If an employee never returns to work following a work-related injury, the employer must check the “days away from work” column, and enter an estimate of the number of days the employee would have required to recuperate from the injury, up to180 days. Generally, the employer must record any case in which an employee’s work is restricted because of a work-related injury. A work restriction, as defined in section 1904.7(b)(4)(i)(A), occurs when the employer keeps the employee from performing one or more routine functions of the job, or from working the full workday the employee would otherwise have been scheduled to work. The case in question is recordable if the employee would have worked 10 hours had he or she not been injured. Question 7-16. Is the employer subject to a citation for violating section 1904.7(b)(4) (viii) if an employee fails to follow a recommended work restriction? Question 7-18. How would the employer record the change on the OSHA 300 Log for an injury or illness after the injured worker reached the cap of 180 days for restricted work and then was assigned to “days away from work”? The employer must check the box that reflects the most severe outcome associated with a given injury or illness. The severity of any case decreases on the log from column G (Death) to column J (Other recordable case). Since days away from work is a more severe outcome than restricted work the employer is required to remove the check initially placed in the box for job transfer or restriction and enter a check in the box for days away from work (column H). Employers are allowed to cap the number of days away and/or restricted work/job transfer when a case involves 180 calendar days. For purposes of recordability, the employer would enter 180 days in the “Job transfer or restriction” column and may also enter 1 day in the “Days away from work” column to prevent confusion or computer related problems. These cases are recordable throughout the five-year record retention and updating period contained in section 1904.33. The cases would be recorded on either the log of the year in which the injury or illness occurred or the last date of employment. If the employee leaves the company for some reason(s) unrelated to the injury or illness, section 1904.7(b)(3)(viii) of the rule allows the employer to stop counting days away from work or days of restriction/job transfer. In order to stop a count, the employer must first have a count to stop. Thus, the employer must count at least one day away from work or day of restriction/job transfer on the OSHA 300 Log. If the employee leaves the company for some reason(s) related to the injury or illness, section 1904.7(b)(3)(viii) of the rule directs the employer to make an estimate of the count of days away from work or days of restriction/job transfer expected for the particular type of case. Question 7-22 If an employee has an adverse reaction to a smallpox vaccination; is it recordable under OSHA’s recordkeeping rule? For purposes of OSHA recordkeeping, the employer would stop the count of the days of restricted work activity due to the first case, the shoulder injury, and enter the foot injury as a new case and record the number of restricted work days. If the restriction related to the second case, the foot injury, is lifted and the employee is still subject to the restriction related to their shoulder injury, the employer must resume the count of days of restricted work activity for that case. To read the regulation: 1904.8 Recording criteria for needlestick and sharps injuries. The OSHA Bloodborne Pathogens Standard states: “The requirement to establish and maintain a sharps injury log shall apply to any employer who is required to maintain a log of occupational injuries and illnesses under 29 CFR 1904.” Therefore, if an employer is exempted from the OSHA recordkeeping rule, the employer does not have to maintain a sharps log. For example, dentists’ offices and doctors’ offices are not required to keep a sharps log after January 1, 2002. Question 8-2. Can I use the OSHA 300 Log to meet the Bloodborne Pathogen Standard’s requirement for a sharps injury log? Employers should use the same baseline that they would use to comply with OSHA’s Noise Standard, Part 1910.95. If the employer chose to revise an employee’s baseline due to a previous STS, then the employer would use the same revised baseline when determining recordability under section 1904.10 of the recordkeeping regulation. Physician or other licensed health care professional (PLHCP) must follow the rules set out in 1904.5 to determine if the hearing loss is work-related. If an event or exposure in the work environment either caused or contributed to the hearing loss, or significantly aggravated a pre-existing hearing loss, the physician or licensed health care professional must consider the case to be work related. It is not necessary for work to be the sole cause, or the predominant cause, or even a substantial cause of the hearing loss; any contribution from work makes the case work-related. The employer is responsible for ensuring that the PLHCP applies the analysis in Section 1904.5 when evaluating work-related hearing loss, if the employer chooses to rely on the PLHCP’s opinion in determining recordability. Yes. OSHA believes that this would be an unusual circumstance and that leaving this information off the log will rarely be needed. However, if the employer has reason to believe that the employee’s name can be identified through this information, these fields can be left blank. Question 29-4. May employers attach missing information to their accident investigation or workers’ compensation forms to make them an acceptable substitute form for the OSHA 301 for recordkeeping purposes? Yes, the employer may use a workers’ compensation form or other form that does not contain all the required information, provided the form is supplemented to contain the missing information and the supplemented form is as readable and understandable as the OSHA 301 form and is completed using the same instructions as the OSHA 301 form. Question 29-5. If an employee reports an injury or illness and receives medical treatment this year, but states that the symptoms first arose at some unspecified date last year, on which year’s log do I record the case? Ordinarily, the case should be recorded on the Log for the year in which the injury or illness occurred. Where the date of injury or illness cannot be determined, the date the employee reported the symptoms or received treatment must be used. In the case in question, the injury or illness would be recorded on this year’s Log because the employee cannot specify the date when the symptoms occurred. An injury or illness is an abnormal condition or disorder. Employers should look at the examples of injuries and illnesses in the “Classifying Injuries and Classifying Illnesses” section of the Recordkeeping Forms Package for guidance. If still unsure about the classification, employers could use the longstanding distinction between injuries that result from instantaneous events or those from exposures in the work environment. Cases resulting from anything other than an instantaneous event or exposure are considered illnesses. Question 31-1. How is the term”supervised” in section 1904.31 defined for the purpose of determining whether the host employer must record the work-related injuries and illnesses of employees obtained from a temporary help service? Question 32-1. How do I calculate the “total hours worked” on my annual summary when I have both hourly and temporary workers? Employers are required to let employees know how and when to report work-related injuries and illnesses. This means that the employer must set up a way for the employees to report work-related injuries and illnesses and tell its employees how to use it. The Recordkeeping rule does not specify how the employer must accomplish these objectives, so employers have the flexibility to set up systems that are appropriate to their workplace. The size of the workforce, employee’s language proficiency and literacy levels, the workplace culture, and other factors will determine what will be effective for any particular workplace. Question 35-2. Do I have to give my employees and their representative’s access to the OSHA injury and illness records? The employer must orally report a work-related fatality by telephone or in person to the OSHA Area Office nearest to the site of the incident. The employer must report the fatality within eight hours of the employee’s death in cases where the death occurs within 30 days of the incident. The employer need not report a death occurring more than 30 days after a work-related incident. Question 39-2. What is considered a “construction work zone” for purposes of section 1904.39(b)(3)? A “construction work zone” for purposes of §1904.39(b)(3) is an area of a street or highway where construction activities are taking place and is typically marked by signs, channeling devices, barriers, pavement markings and/or work vehicles. The work zone extends from the first warning sign or rotating/strobe lights on a vehicle to the “END ROAD WORK” sign or the last temporary traffic control device.